← Where do Muppets come from? It has always struck me as a little make-believish, the clock that is. You have a small plastic kitchen in your basment. How embarassing would a clock like that look above it. I think it might add a nice playroom (not bedroom) feel. Also that clock was made before electricity was around, and Ron just fixed it. I estimate that clock to last about 23 more years. It is a wooden kitchen in the basement, except for a few plastic knobs. I am loath to throw anything old away, but don’t use the kitchen as a reason to put it there. That said, I do think Evie would love the cuckoo. Although, they drive me crazy and I might be lead to wring the little bird’s neck. It’s so amazing to me to hear you call it “hideous.” I guess because it’s hung on my living room wall for so long I barely realized what was actually on it anymore. How about quaint??? Considering that, for many years, we had a stuffed deer head hanging on the wall, this clock seems pretty tame in comparison. In my experience, once you get used to the noise, you never even hear it or look at it any more. 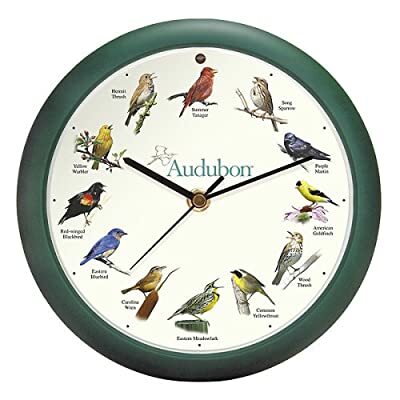 As far as a selling point, it does have its uses: picture yourself laying in bed, too tired to open your eyes to look at the clock, all you have to do is wait for the cuckoo and count the # of cuckoos. For the record, Ron took it apart, fixed it, oiled it, and put it back together, and it works well. He said when he went to get parts for it, the clock repair person said “it’s in mint condition and it’s a genuine Black Forest cuckoo clock, made in Germany”. I wanted it fixed because I thought Evie would enjoy it, but maybe Nathan would take it??? Bottom line though, even if you or no one else wanted it, I don’t think I could actually get rid of it. I have fond memories of my own grandparents’ cuckoo clock back when I was a child. Ron says it will always have a home because we would proudly display it at our house! I said I wanted it!! still…I don’t think your descriptive words (e.g. hideousness, grotesque) will help your case. Ron suggested you go to E-Bay to see how much it would sell for because he says his clock sold for $400 to $500 about 18 yrs. ago. I’m not trying to sell it! I want to hang it on my wall! If you want to sell it to make money, then you should do that. I don’t really want to get in an argument about what words describe it, but A) I think those words are appropriate for anything that has hanging animal carcasses on it, and B) I am trying to appeal to Sara and those are her ideas of the clock, for better or worse. I generally don’t assert my opinion on here, but I am being misrepresented. My main problem with the clock are the two guns slung across the front of it. I get that it is about hunting, but 1-we do not hunt and 2-that’s not what guns are used for where we live. It just seems like it would be an odd addition to our home on that basis. That’s the only argument against it I have really had. Sara, I truly understand your point and it’s really not a big deal to me if you take it or not. I’m definitely not a “hunting” or a “gun” person. Everything I’ve said is for that purpose – reframing it as unique, interesting, quaint – getting the monetary value from E-Bay – repeating what the clock repair person said – counting the cuckoos instead of having to look at the clock, etc. Pingback: Data Mining « Is this thing on? Wait!! I am called Grandma Cuckoo because of my love of cuckoo clocks. I would be a perfiict person to rehome this clock. I never gets old to me – the chimes, the cuckoos – I listened for it always. I don’t have one now. I plead my case! Lol, this post is almost 10 years old! I’m pretty sure Rachael ended up with that clock (no way mom was going to give it to me after I called it “grotesque”). I will note, though, that she currently has a DIFFERENT cuckoo clock hanging up in her living room!